Your network engineers and Information Technology teams get to rely on outside support from 3rd party help desk and IT specialist companies. Your legal departments likely pay high hourly rates for specialized legal advice from outside council. Even your finance/accounting group likely has an auditing firm on retainer that they can call for tax advice throughout the year. But, traditionally, procurement and sourcing groups don’t have anyone they can turn to in a short-term support capacity. Source One seeks to change that with its newest offering: Procurement Help Desk. Think of Source One’s procurement help desk as an extension of your internal procurement, purchasing, strategic sourcing and supply chain groups; without the high costs of having a huge staff. The Source One procurement help desk is a dynamic service offering that provides procurement departments with access to additional surge resources or subject matter experience on-demand. 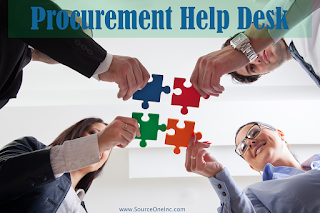 With the Source One procurement help desk, a corporate procurement team can reach out to the Source One procurement help desk and get answers to general procurement questions or get temporary support from accomplished subject matter experts in hundreds of spend categories. Think of having access to all of the procurement subject matter expertise of the largest consulting firms; but not having to commit to outsourcing your whole procurement group or signing up for high six-figure retainer agreements. Instead, Source One will build a customized right-sized retainer agreement for your organization that fits your needs and doesn’t drain your department’s budget. Rather than having to go through the contracting cycle and sourcing process every time you need a little bit of help in an oddball spend category; just pull time from the procurement help desk retainer. The Source One procurement help desk supports just about any need that a procurement department might have. This includes getting access to benchmark data, support reviewing contracts or pricing agreements, data analytics and data analysis support, strategic sourcing assistance, procurement strategy, procurement advisory, procurement metrics, supplier identification and negotiation support. Need an expert in Cloud Hosting Agreements or a negotiator that can decipher and decouple your marketing department’s chosen creative agency?...the help desk would work for you. The Source One Procurement Help Desk was designed to support any size business. Small manufacturers can benefit from gaining access to subject matter experts in categories they can't afford to get full-time support in, or they can leverage the international low cost sourcing experts to help move their product lines around the world. Larger organizations can use the procurement help desk for a second set of eyes on the next contract; understanding how they perform against other procurement groups; or as surge support for busy sourcing seasons. See how it works and get an idea for pricing for Procurement Help Desk. Learn more about Source One’s Procurement Help Desk. See Source One's other Procurement Resources.